The anniversaries are coming thick and fast in the Aussie beer world right now. Among a run of major anniversaries comes this, the 1000th brew by Bridge Road, less than ten years after the first took place in the original brewery a couple of kilometres from the Beechworth brewery's current home in the Old Coach House. To mark the occasion, founder Ben Kraus was always going to go big and, having already released an imperial porter, various high alcohol barrel-aged Belgian beers and a double IPA among other things, he opted for his first imperial stout. And, as you'd expect from a brewery that doesn't tend to hold back when going big, particularly on the hop front, they went big. 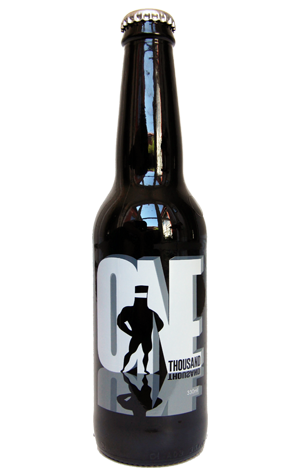 The 11.2 percent, black as night beer is the sort of oily drop that doesn't so much pour into a glass as crawl menacingly down its sides, with the seriously dark brown head hinting at the layers of roasted and caramelised malts inside. Given the beer is young, it's the hops, however, that hit you first: a fierce cloud of fruitiness that makes the beer, at this stage at least, reminiscent on the nose to the last couple of releases of the B2 Bomber in its early days. As it goes down in its thick, resinous way and warms as it goes, you'll find all manner of things going on: milk chocolate; sugary espresso; booze; toffee; toasted nuts; tarry molasses; a lingering roast-tinged bitterness. No doubt it will mellow over time so perhaps take Ben's advice to a poster on Instagram on when to consume it: "One now and then again next Christmas."